Download "Short title 1. This Act may be cited as the Accountants Act. Interpretation 2. 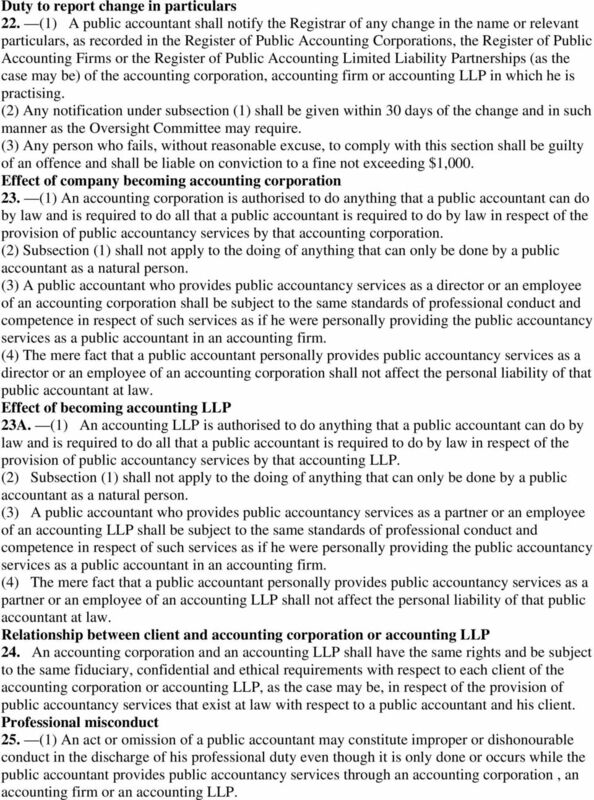 In this Act, unless the context otherwise requires "accounting"
2 such negligence by any director of such accounting corporation or any partner of such accounting LLP), or fraud or dishonesty; "public accountancy services" means the audit and reporting on financial statements and the doing of such other acts that are required by any written law to be done by a public accountant; "public accountant" means a person who is registered or deemed to be registered in accordance with this Act as a public accountant; "Register of Public Accountants" means the register kept and maintained under section 5 (1) (a) (i); "Register of Public Accounting Corporations" means the register kept and maintained under section 5 (1) (a) (ii); "Register of Public Accounting Firms" means the register kept and maintained under section 5 (1) (a) (iii); "Register of Public Accounting Limited Liability Partnerships" means the register kept and maintained under section 5 (1) (a) (iv); "Registrar" means the Registrar of Public Accountants appointed by the Authority under section 7 (1) (a) and includes a Deputy Registrar and an Assistant Registrar appointed under section 7 (1) (b); "relevant particulars", in relation to a public accountant, an accounting corporation, an accounting firm or an accounting LLP, means such particulars of the public accountant, accounting corporation, accounting firm or accounting LLP as the Oversight Committee may determine to be relevant for inclusion in the Register of Public Accountants, the Register of Public Accounting Corporations, the Register of Public Accounting Firms or the Register of Public Accounting Limited Liability Partnerships, as the case may be; "repealed Accountants Act" means the Accountants Act (Cap. 2, 2001 Ed.) in force immediately before 1st April 2004; "rules" means rules made under section 64; "voting share", in relation to a company or an accounting corporation, means an issued share in the company or accounting corporation other than (a) a share to which, in no circumstances, is there attached a right to vote; or (b) a share to which there is attached a right to vote only in one or more of the following circumstances: (i) during a period in which a dividend (or part of a dividend) in respect of the share is in arrears; (ii) upon a proposal to reduce the share capital of the company or accounting corporation; (iii) upon a proposal that affects rights attached to the share; (iv) upon a proposal to wind up the company or accounting corporation; (v) upon a proposal for the disposal of the whole of the property, business and undertakings of the company or accounting corporation; (vi) during the winding up of the company or accounting corporation. Administration of Act 3. The Authority shall be responsible (a) for the registration of public accountants and the approval of accounting corporations, accounting firms and accounting LLPs and the names thereof under this Act; (b) for the control and regulation of the practice of the profession of accountancy by public accountants, accounting corporations, accounting firms and accounting LLPs; and (c) generally, for the administration of this Act, and shall carry out such functions subject to the general or special directions of the Minister. 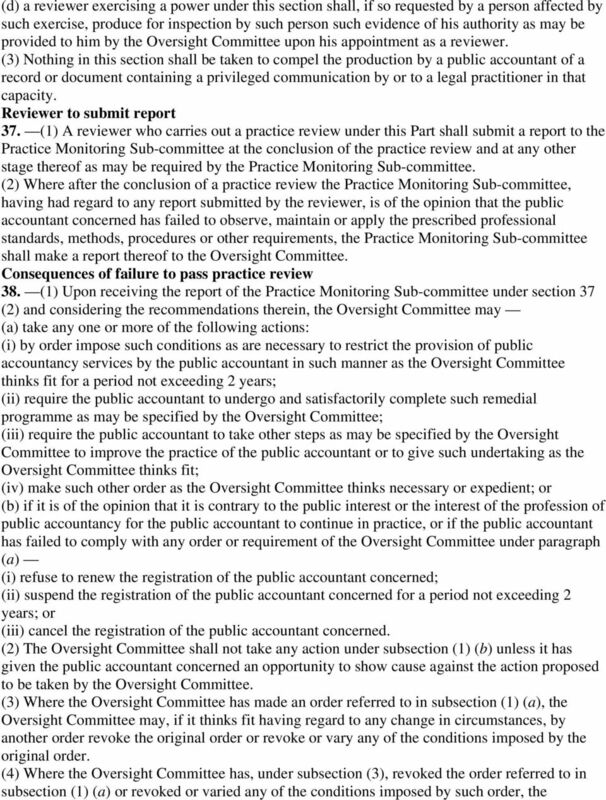 3 Appointment of Public Accountants Oversight Committee 4. (1) For the discharge of its functions under section 3, the Authority may, with the approval of the Minister and subject to subsection (2), appoint from among its members a committee to be known as the Public Accountants Oversight Committee. (2) At least one member of the Oversight Committee shall be a public accountant. (3) The Oversight Committee shall carry out the functions and duties and exercise the powers conferred on it by this Act in accordance with such general or special directions as the Authority may from time to time give to the Oversight Committee. 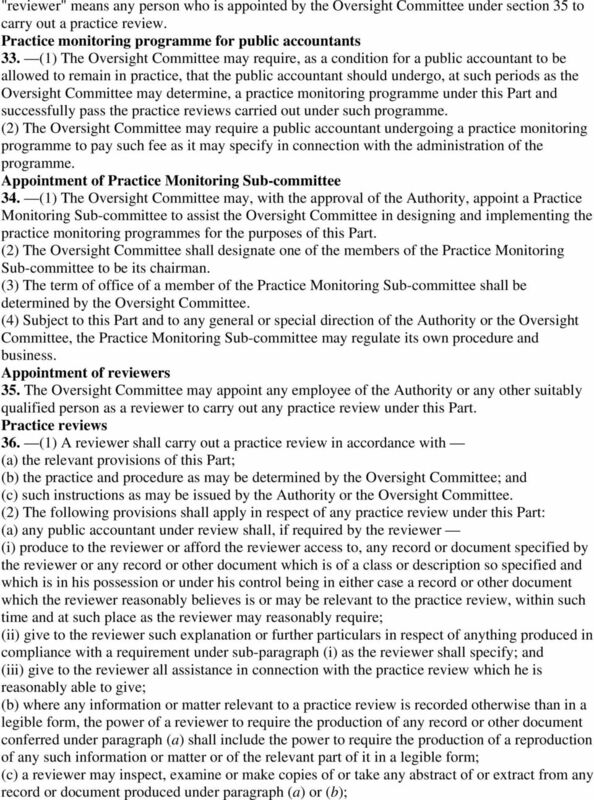 (4) The Schedule shall have effect with respect to the Oversight Committee, its members and proceedings. (5) The Authority may, with the approval of the Minister, amend or vary the Schedule by order in the Gazette. Functions and powers of Oversight Committee 5. (1) The Oversight Committee shall assist the Authority in the discharge of the Authority s functions under section 3 and, in so doing, shall (a) keep and maintain (i) a Register of Public Accountants; (ii) a Register of Public Accounting Corporations; (iii) a Register of Public Accounting Firms; (iv) a Register of Public Accounting Limited Liability Partnerships; and (v) such other registers as may be necessary for the purposes of this Act; (b) consider and, as appropriate, grant (whether unconditionally or subject to such conditions as it thinks fit) or reject (i) all applications for registration made under Part III; and (ii) all applications for approval under Part IV; (c) assist the Authority in determining, prescribing and reviewing the requirements to be satisfied by persons seeking to be registered as public accountants under Part III; (d) conduct or arrange for the conduct of such examinations as it thinks necessary for the purposes of registering public accountants; (e) administer the continuing professional education programmes for public accountants; (f) administer the practice monitoring programmes under Part V; (g) assist the Authority in determining, prescribing and reviewing (i) the codes of professional conduct and ethics for public accountants; and (ii) the standards, methods and procedures to be applied by public accountants when providing public accountancy services; (h) inquire into (i) any complaint against any public accountant, accounting corporation, accounting firm or accounting LLP; or (ii) any information relating to any professional misconduct on the part of any public accountant, accounting corporation, accounting firm or accounting LLP, and, if necessary, institute disciplinary proceedings in accordance with Part VI; (i) advise the Authority on any matter which relates to the profession of public accountancy; and (j) generally do all such acts, matters and things as are necessary to be carried out, or which the Oversight Committee is authorised to carry out, under this Act. (2) The registers referred to in subsection (1) (a) may be kept in such form or manner as the Oversight Committee may determine. 6 (a) the prescribed fee; and (b) a declaration by the applicant verifying any information contained in or relating to the application. (3) The Oversight Committee may require an applicant for registration to undergo such interviews as the Oversight Committee may determine. 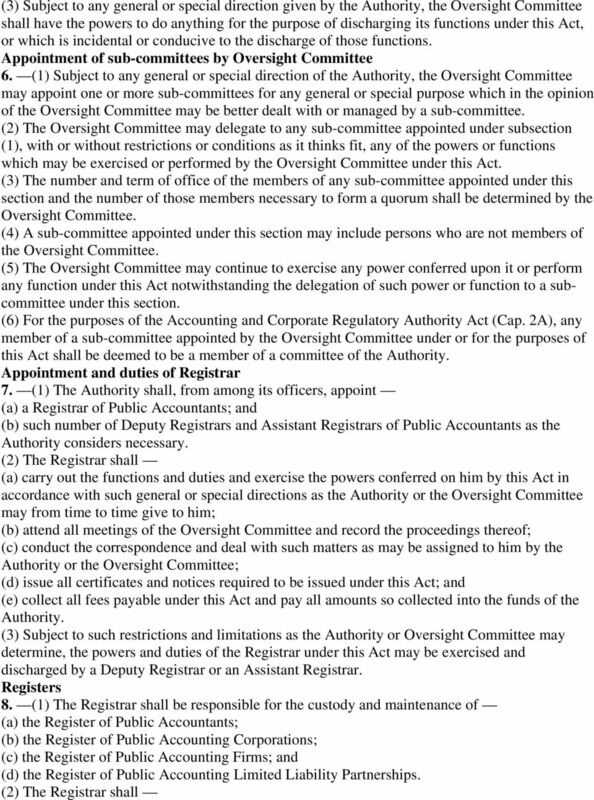 (4) The Oversight Committee may refuse to register any applicant who (a) in the opinion of the Oversight Committee (i) is not of good reputation or character; (ii) is engaged in any business or occupation that is inconsistent with the integrity of a public accountant; or (iii) is otherwise unfit to practise as a public accountant; or (b) has had his registration, licence or approval to practise as a public accountant in any other country withdrawn, suspended, cancelled or revoked. (5) Where the Oversight Committee refuses to register an applicant, it shall by notice in writing inform the applicant of its refusal. (6) Any person who is aggrieved by any refusal of the Oversight Committee under subsection (4) may, within 30 days of the notice given under subsection (5), appeal to the Minister whose decision shall be final. 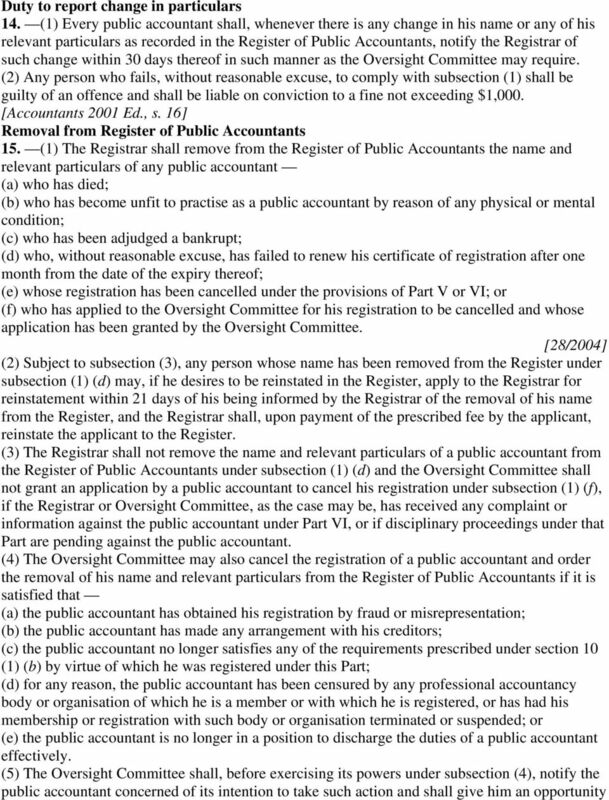 [Accountants 2001 Ed., s. 13] Certificate of registration and record in Register of Public Accountants 12. (1) Upon a person being registered as a public accountant under this Part, the Registrar shall (a) issue to him a certificate of registration; and (b) record his name and relevant particulars in the Register of Public Accountants. (2) A certificate of registration shall be issued in such form or manner as the Oversight Committee may determine. (3) Subject to the provisions of this Act, every such certificate of registration shall be in force from the date of its issue or renewal to 31st December of the year in respect of which the certificate is issued or renewed. [Accountants 2001 Ed., s. 15] Renewal of registration 13. 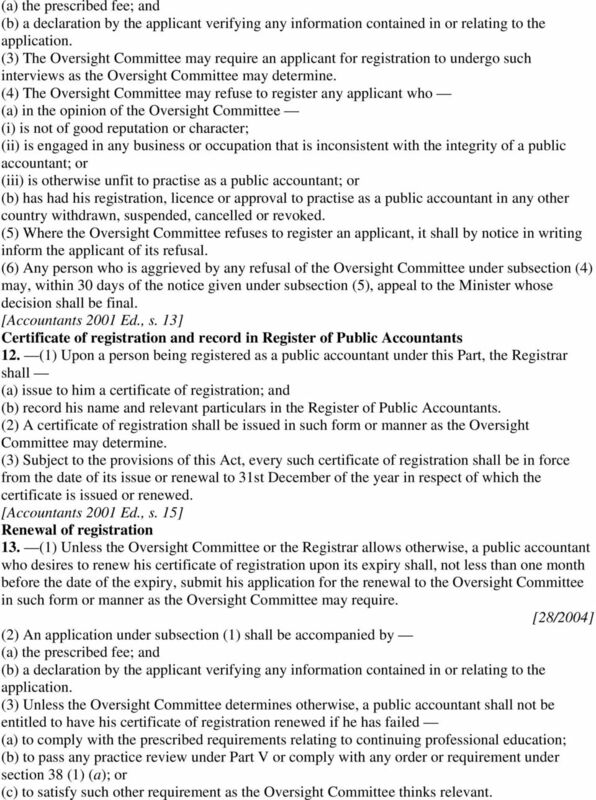 (1) Unless the Oversight Committee or the Registrar allows otherwise, a public accountant who desires to renew his certificate of registration upon its expiry shall, not less than one month before the date of the expiry, submit his application for the renewal to the Oversight Committee in such form or manner as the Oversight Committee may require. [28/2004] (2) An application under subsection (1) shall be accompanied by (a) the prescribed fee; and (b) a declaration by the applicant verifying any information contained in or relating to the application. (3) Unless the Oversight Committee determines otherwise, a public accountant shall not be entitled to have his certificate of registration renewed if he has failed (a) to comply with the prescribed requirements relating to continuing professional education; (b) to pass any practice review under Part V or comply with any order or requirement under section 38 (1) (a); or (c) to satisfy such other requirement as the Oversight Committee thinks relevant. 8 to submit reasons, within such period as the Oversight Committee may determine, as to why his registration should not be cancelled. (6) Any public accountant who is aggrieved by an order under subsection (4) may, within 30 days of being notified of the order, appeal to the Minister whose decision shall be final. Publication of list of public accountants 16. The Registrar may, from time to time, prepare and publish in such form or manner as the Oversight Committee may determine a list of the names and particulars of all public accountants. Approval of accounting corporations 17. (1) A public accountant who wishes to have a company or proposed company approved as an accounting corporation may apply to the Oversight Committee for approval of (a) the company as an accounting corporation; and (b) the name or proposed name of the accounting corporation. (2) An application under subsection (1) shall be made in accordance with the prescribed requirements and shall be accompanied by the prescribed fee. 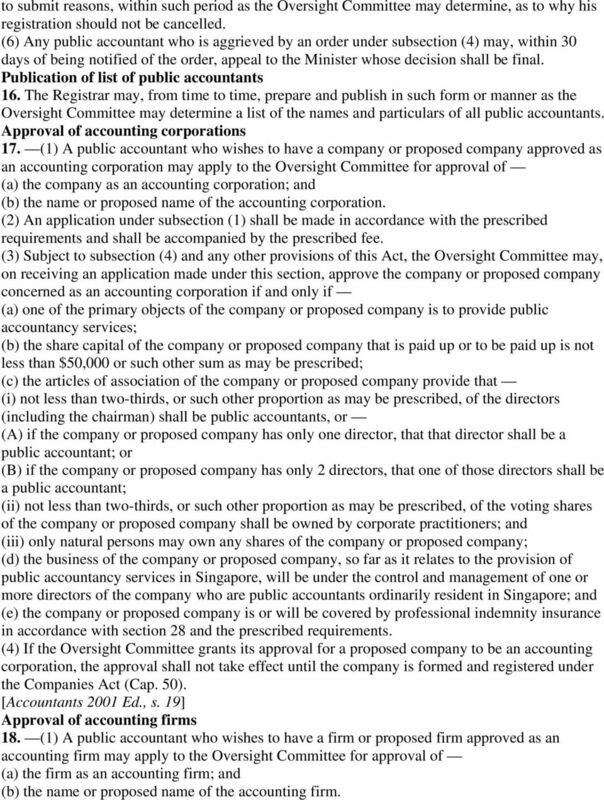 (3) Subject to subsection (4) and any other provisions of this Act, the Oversight Committee may, on receiving an application made under this section, approve the company or proposed company concerned as an accounting corporation if and only if (a) one of the primary objects of the company or proposed company is to provide public accountancy services; (b) the share capital of the company or proposed company that is paid up or to be paid up is not less than $50,000 or such other sum as may be prescribed; (c) the articles of association of the company or proposed company provide that (i) not less than two-thirds, or such other proportion as may be prescribed, of the directors (including the chairman) shall be public accountants, or (A) if the company or proposed company has only one director, that that director shall be a public accountant; or (B) if the company or proposed company has only 2 directors, that one of those directors shall be a public accountant; (ii) not less than two-thirds, or such other proportion as may be prescribed, of the voting shares of the company or proposed company shall be owned by corporate practitioners; and (iii) only natural persons may own any shares of the company or proposed company; (d) the business of the company or proposed company, so far as it relates to the provision of public accountancy services in Singapore, will be under the control and management of one or more directors of the company who are public accountants ordinarily resident in Singapore; and (e) the company or proposed company is or will be covered by professional indemnity insurance in accordance with section 28 and the prescribed requirements. (4) If the Oversight Committee grants its approval for a proposed company to be an accounting corporation, the approval shall not take effect until the company is formed and registered under the Companies Act (Cap. 50). [Accountants 2001 Ed., s. 19] Approval of accounting firms 18. (1) A public accountant who wishes to have a firm or proposed firm approved as an accounting firm may apply to the Oversight Committee for approval of (a) the firm as an accounting firm; and (b) the name or proposed name of the accounting firm. 9 (2) An application under subsection (1) shall be made in accordance with the prescribed requirements and shall be accompanied by the prescribed fee. 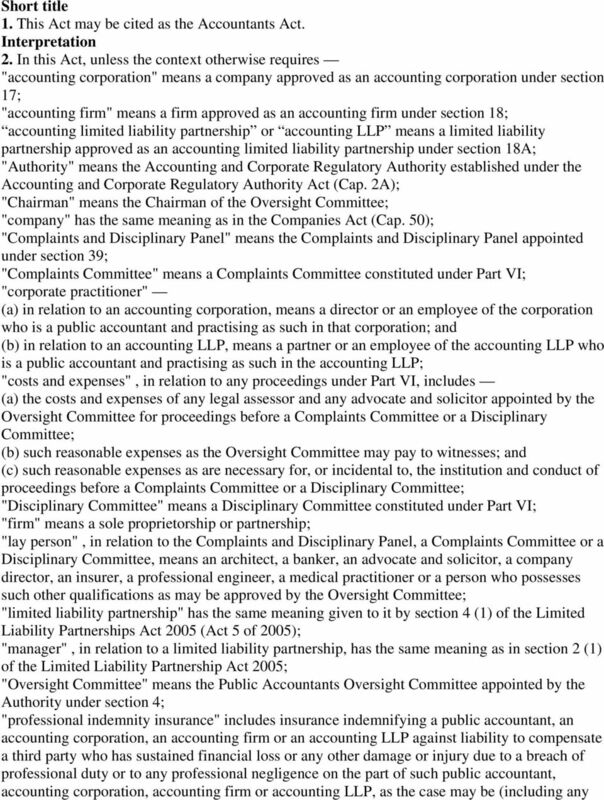 (3) The Oversight Committee may, on receiving an application made under this section, approve the firm or proposed firm concerned as an accounting firm if and only if (a) one of the primary objects of the firm or proposed firm is to provide public accountancy services; (b) at least two-thirds, or such other proportion as may be prescribed, of the partners are public accountants, or if the partnership has only 2 partners, one of those partners is a public accountant; and (c) the business of the partnership, so far as it relates to the supply of public accountancy services in Singapore, will be under the control and management of one or more partners who are public accountants ordinarily resident in Singapore. Approval of accounting LLPs 18A. 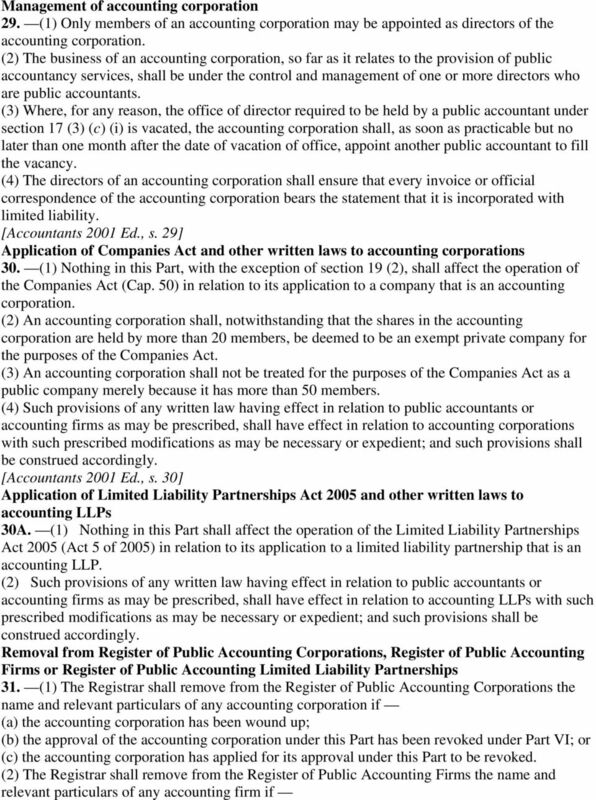 (1) A public accountant who wishes to have a limited liability partnership or proposed limited liability partnership approved as an accounting LLP may apply to the Oversight Committee for the approval of (a) the limited liability partnership as an accounting LLP; and (b) the name or proposed name of the accounting LLP. (2) An application under subsection (1) shall be made in accordance with the prescribed requirements and shall be accompanied by the prescribed fee. 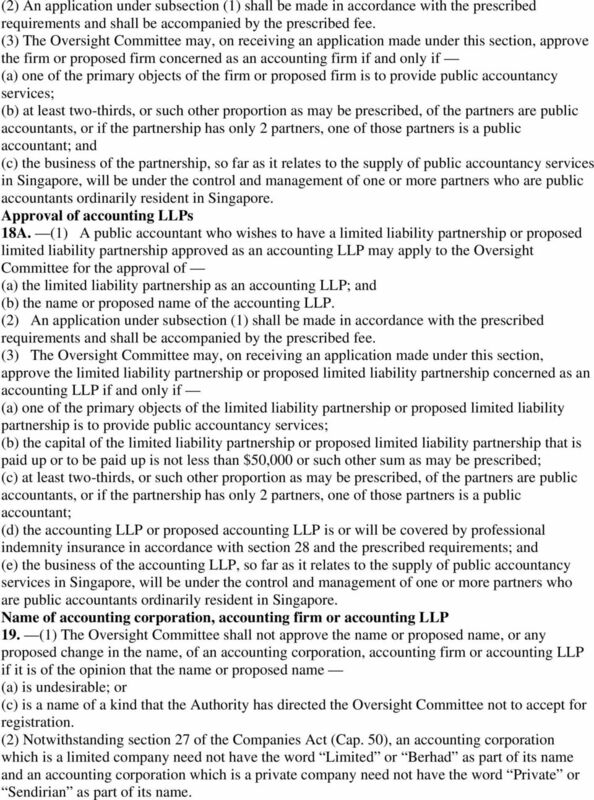 (3) The Oversight Committee may, on receiving an application made under this section, approve the limited liability partnership or proposed limited liability partnership concerned as an accounting LLP if and only if (a) one of the primary objects of the limited liability partnership or proposed limited liability partnership is to provide public accountancy services; (b) the capital of the limited liability partnership or proposed limited liability partnership that is paid up or to be paid up is not less than $50,000 or such other sum as may be prescribed; (c) at least two-thirds, or such other proportion as may be prescribed, of the partners are public accountants, or if the partnership has only 2 partners, one of those partners is a public accountant; (d) the accounting LLP or proposed accounting LLP is or will be covered by professional indemnity insurance in accordance with section 28 and the prescribed requirements; and (e) the business of the accounting LLP, so far as it relates to the supply of public accountancy services in Singapore, will be under the control and management of one or more partners who are public accountants ordinarily resident in Singapore. Name of accounting corporation, accounting firm or accounting LLP 19. (1) The Oversight Committee shall not approve the name or proposed name, or any proposed change in the name, of an accounting corporation, accounting firm or accounting LLP if it is of the opinion that the name or proposed name (a) is undesirable; or (c) is a name of a kind that the Authority has directed the Oversight Committee not to accept for registration. (2) Notwithstanding section 27 of the Companies Act (Cap. 50), an accounting corporation which is a limited company need not have the word Limited or Berhad as part of its name and an accounting corporation which is a private company need not have the word Private or Sendirian as part of its name. 10 (3) Every accounting corporation shall have either the words Public Accounting Corporation as part of its name or the acronym PAC at the end of its name, and no person, firm or company other than an approved accounting corporation shall have such words or acronym as part of or at the end of its name, as the case may be. (4) The name of an accounting corporation, accounting firm or accounting LLP shall not be changed without the prior approval in writing of the Oversight Committee. (5) Notwithstanding anything in this section, section 27 of the Companies Act or section 19 of the Limited Liability Partnerships Act 2005 (Act 5 of 2005), where the Oversight Committee is satisfied that the name of an accounting corporation, accounting firm or accounting LLP has been approved (whether through inadvertence or otherwise and whether originally or by change of name) in contravention of subsection (1), the Oversight Committee may direct the accounting corporation, accounting firm or accounting LLP to change its name. 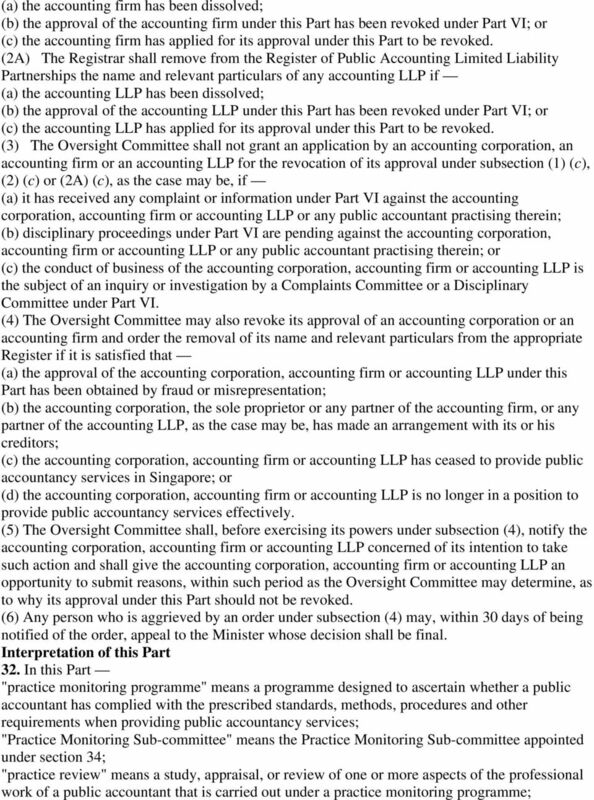 (6) The accounting corporation, accounting firm or accounting LLP shall comply with the direction of the Oversight Committee under subsection (5) within 6 weeks after the date of the direction or such longer period as the Oversight Committee may allow unless the direction is annulled by the Minister. [Accountants 2001 Ed., s. 20] Right of appeal against decision of Oversight Committee 20. 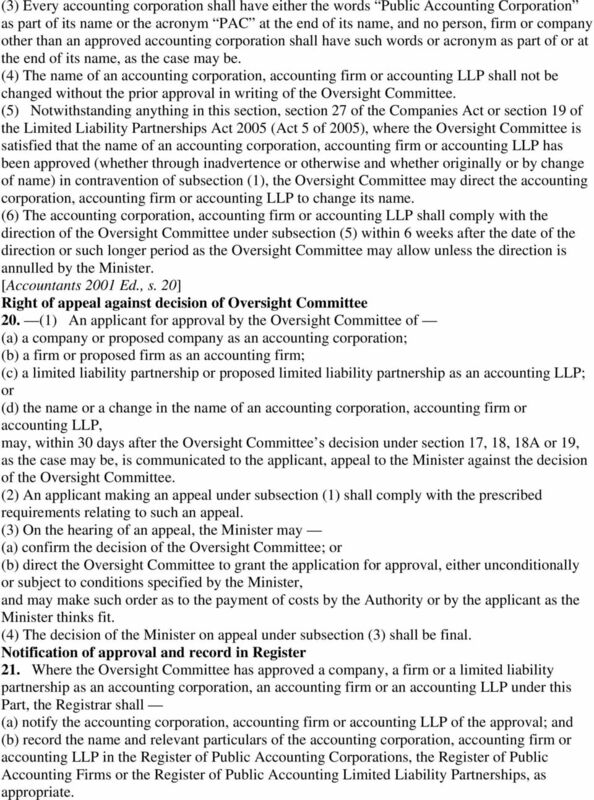 (1) An applicant for approval by the Oversight Committee of (a) a company or proposed company as an accounting corporation; (b) a firm or proposed firm as an accounting firm; (c) a limited liability partnership or proposed limited liability partnership as an accounting LLP; or (d) the name or a change in the name of an accounting corporation, accounting firm or accounting LLP, may, within 30 days after the Oversight Committee s decision under section 17, 18, 18A or 19, as the case may be, is communicated to the applicant, appeal to the Minister against the decision of the Oversight Committee. (2) An applicant making an appeal under subsection (1) shall comply with the prescribed requirements relating to such an appeal. (3) On the hearing of an appeal, the Minister may (a) confirm the decision of the Oversight Committee; or (b) direct the Oversight Committee to grant the application for approval, either unconditionally or subject to conditions specified by the Minister, and may make such order as to the payment of costs by the Authority or by the applicant as the Minister thinks fit. (4) The decision of the Minister on appeal under subsection (3) shall be final. Notification of approval and record in Register 21. Where the Oversight Committee has approved a company, a firm or a limited liability partnership as an accounting corporation, an accounting firm or an accounting LLP under this Part, the Registrar shall (a) notify the accounting corporation, accounting firm or accounting LLP of the approval; and (b) record the name and relevant particulars of the accounting corporation, accounting firm or accounting LLP in the Register of Public Accounting Corporations, the Register of Public Accounting Firms or the Register of Public Accounting Limited Liability Partnerships, as appropriate. 11 Duty to report change in particulars 22. 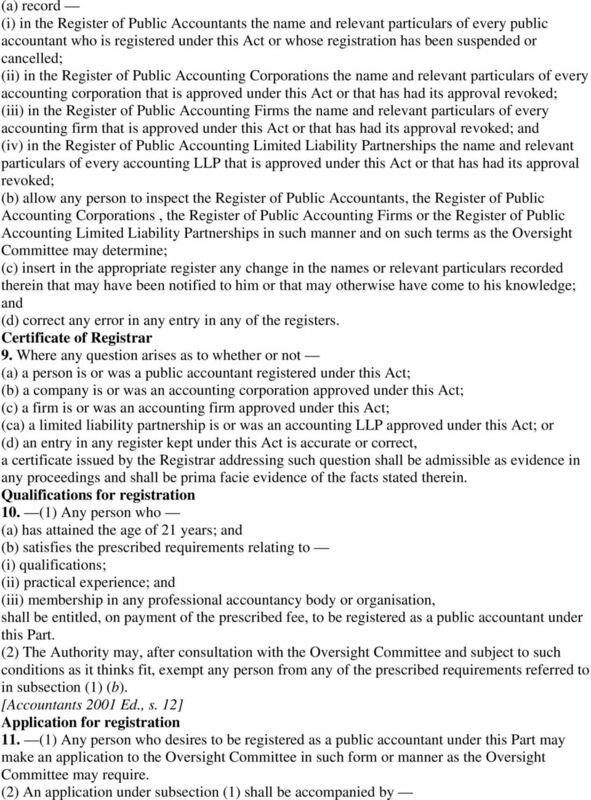 (1) A public accountant shall notify the Registrar of any change in the name or relevant particulars, as recorded in the Register of Public Accounting Corporations, the Register of Public Accounting Firms or the Register of Public Accounting Limited Liability Partnerships (as the case may be) of the accounting corporation, accounting firm or accounting LLP in which he is practising. (2) Any notification under subsection (1) shall be given within 30 days of the change and in such manner as the Oversight Committee may require. (3) Any person who fails, without reasonable excuse, to comply with this section shall be guilty of an offence and shall be liable on conviction to a fine not exceeding $1,000. Effect of company becoming accounting corporation 23. (1) An accounting corporation is authorised to do anything that a public accountant can do by law and is required to do all that a public accountant is required to do by law in respect of the provision of public accountancy services by that accounting corporation. (2) Subsection (1) shall not apply to the doing of anything that can only be done by a public accountant as a natural person. (3) A public accountant who provides public accountancy services as a director or an employee of an accounting corporation shall be subject to the same standards of professional conduct and competence in respect of such services as if he were personally providing the public accountancy services as a public accountant in an accounting firm. (4) The mere fact that a public accountant personally provides public accountancy services as a director or an employee of an accounting corporation shall not affect the personal liability of that public accountant at law. Effect of becoming accounting LLP 23A. (1) An accounting LLP is authorised to do anything that a public accountant can do by law and is required to do all that a public accountant is required to do by law in respect of the provision of public accountancy services by that accounting LLP. (2) Subsection (1) shall not apply to the doing of anything that can only be done by a public accountant as a natural person. (3) A public accountant who provides public accountancy services as a partner or an employee of an accounting LLP shall be subject to the same standards of professional conduct and competence in respect of such services as if he were personally providing the public accountancy services as a public accountant in an accounting firm. (4) The mere fact that a public accountant personally provides public accountancy services as a partner or an employee of an accounting LLP shall not affect the personal liability of that public accountant at law. Relationship between client and accounting corporation or accounting LLP 24. An accounting corporation and an accounting LLP shall have the same rights and be subject to the same fiduciary, confidential and ethical requirements with respect to each client of the accounting corporation or accounting LLP, as the case may be, in respect of the provision of public accountancy services that exist at law with respect to a public accountant and his client. Professional misconduct 25. (1) An act or omission of a public accountant may constitute improper or dishonourable conduct in the discharge of his professional duty even though it is only done or occurs while the public accountant provides public accountancy services through an accounting corporation, an accounting firm or an accounting LLP. 12 (2) The directors of an accounting corporation or the partners of an accounting firm or an accounting LLP who are public accountants shall be jointly liable to disciplinary proceedings under this Act if the business of the accounting corporation, accounting firm or accounting LLP is conducted in a manner which would warrant disciplinary proceedings against it and where such conduct cannot be attributed to the act or omission of any particular public accountant or public accountants. [Accountants 2001 Ed., s. 25] Requirements relating to memorandum and articles of association, and annual reports, of accounting corporations 26. (1) The memorandum and articles of association of an accounting corporation shall at all times comply with all the requirements specified in section 17 (3) (a) and (c) and the rules relating thereto. 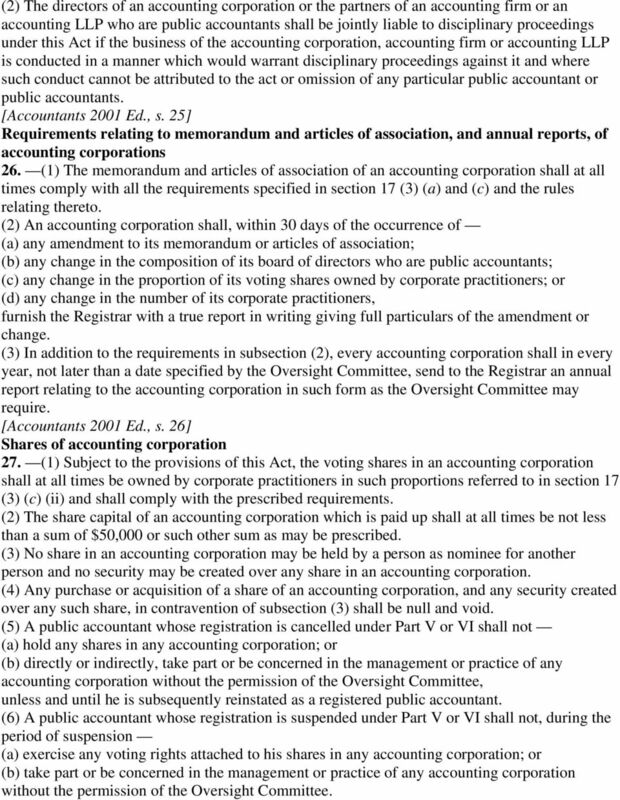 (2) An accounting corporation shall, within 30 days of the occurrence of (a) any amendment to its memorandum or articles of association; (b) any change in the composition of its board of directors who are public accountants; (c) any change in the proportion of its voting shares owned by corporate practitioners; or (d) any change in the number of its corporate practitioners, furnish the Registrar with a true report in writing giving full particulars of the amendment or change. (3) In addition to the requirements in subsection (2), every accounting corporation shall in every year, not later than a date specified by the Oversight Committee, send to the Registrar an annual report relating to the accounting corporation in such form as the Oversight Committee may require. [Accountants 2001 Ed., s. 26] Shares of accounting corporation 27. (1) Subject to the provisions of this Act, the voting shares in an accounting corporation shall at all times be owned by corporate practitioners in such proportions referred to in section 17 (3) (c) (ii) and shall comply with the prescribed requirements. (2) The share capital of an accounting corporation which is paid up shall at all times be not less than a sum of $50,000 or such other sum as may be prescribed. (3) No share in an accounting corporation may be held by a person as nominee for another person and no security may be created over any share in an accounting corporation. (4) Any purchase or acquisition of a share of an accounting corporation, and any security created over any such share, in contravention of subsection (3) shall be null and void. 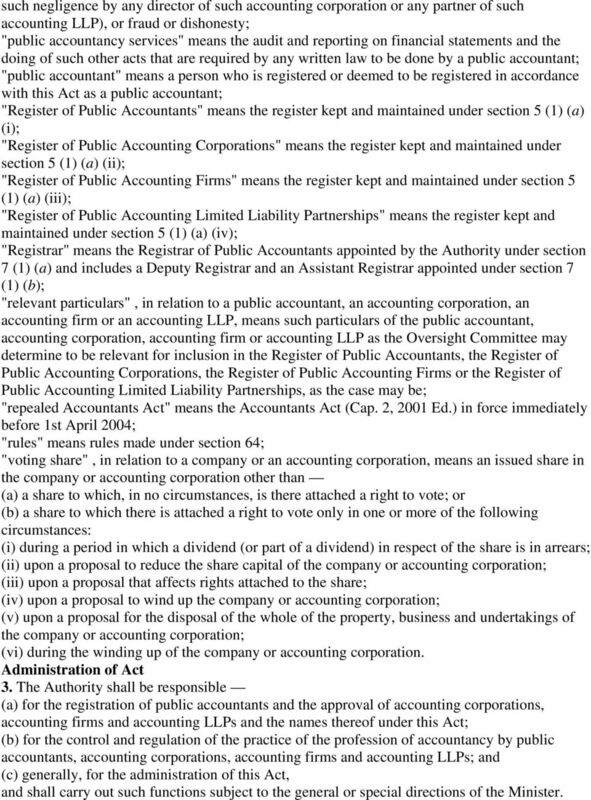 (5) A public accountant whose registration is cancelled under Part V or VI shall not (a) hold any shares in any accounting corporation; or (b) directly or indirectly, take part or be concerned in the management or practice of any accounting corporation without the permission of the Oversight Committee, unless and until he is subsequently reinstated as a registered public accountant. 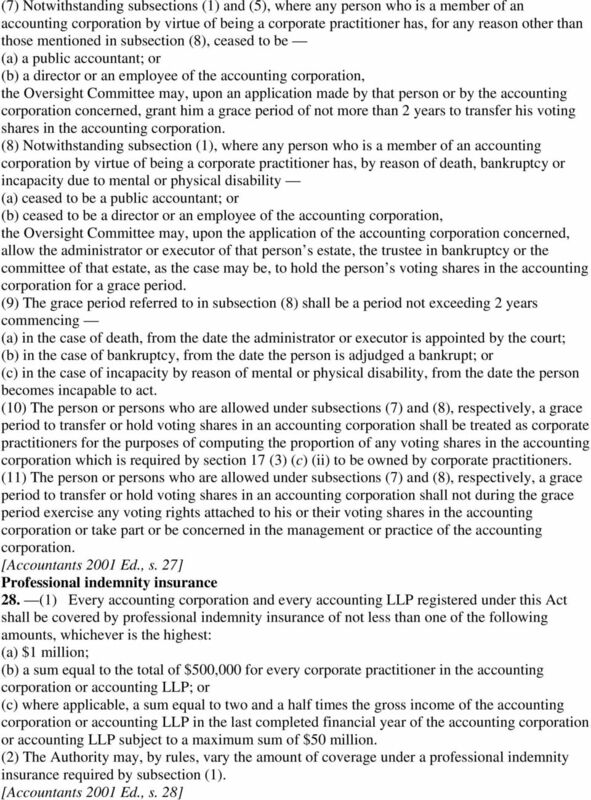 (6) A public accountant whose registration is suspended under Part V or VI shall not, during the period of suspension (a) exercise any voting rights attached to his shares in any accounting corporation; or (b) take part or be concerned in the management or practice of any accounting corporation without the permission of the Oversight Committee. 18 Registrar shall immediately serve on the public accountant concerned a notice of the revocation or variation. (5) A decision of the Oversight Committee under subsection (1) (b) shall not take effect (a) until the expiration of one month from the date on which the decision has been communicated to the public accountant concerned; or (b) where an appeal against the decision is made to the High Court under subsection (7), until the appeal has been determined or withdrawn. 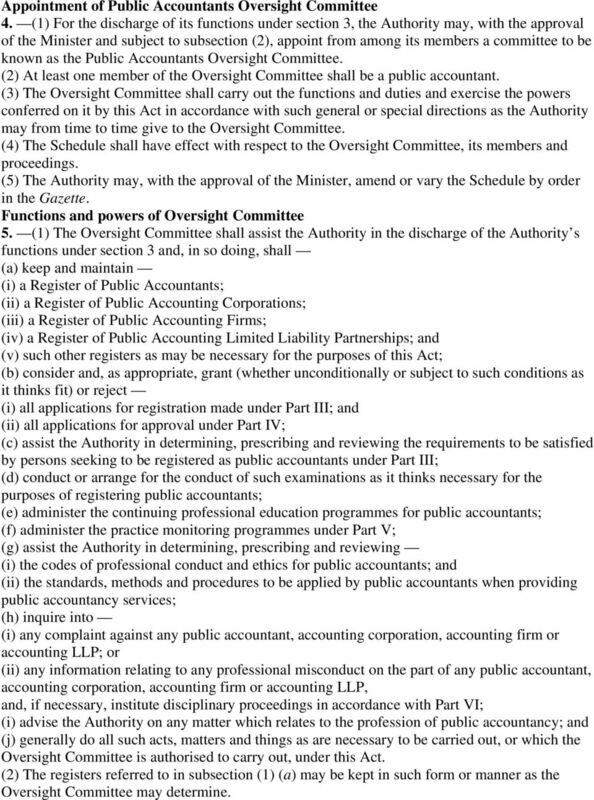 (6) While any public accountant remains suspended under subsection (1) (b) (ii), he shall be deemed not to be registered as a public accountant under this Act but immediately upon the expiry of his period of suspension, his rights and privileges as a public accountant shall forthwith be revived. (7) Any public accountant who is aggrieved by a decision of the Oversight Committee to take action under subsection (1) (b) may appeal to the High Court within a period of 30 days (or such further period as the Oversight Committee may allow on application in any particular case) after the service of the Oversight Committee s decision on the public accountant. (8) The decision of the High Court on an appeal under subsection (7) shall be final. Appointment of Complaints and Disciplinary Panel 39. 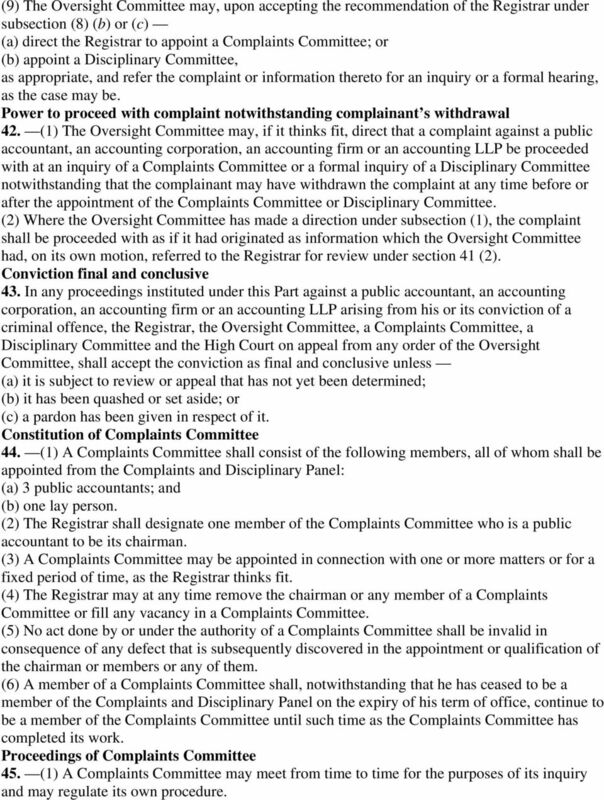 (1) For the purpose of enabling Complaints Committees and Disciplinary Committees to be constituted under this Part, the Oversight Committee shall appoint a panel, to be known as the Complaints and Disciplinary Panel, consisting of such number of public accountants and lay persons as the Oversight Committee thinks fit. (2) A member of the Complaints and Disciplinary Panel shall be appointed for a term of 2 years and shall be eligible for reappointment. (3) The Registrar shall be the Chairman of the Complaints and Disciplinary Panel. (4) The Oversight Committee may at any time remove from office any member of the Complaints and Disciplinary Panel or fill any vacancy in its membership. Complaints against public accountants, accounting corporations, accounting firms and accounting LLPs 40. (1) Any complaint concerning (a) any improper or dishonourable conduct on the part of a public accountant in the discharge of his professional duty; or (b) any improper act or conduct on the part of a public accountant, an accounting corporation, an accounting firm or an accounting LLP, shall be made to the Oversight Committee in writing and shall be supported by such statutory declaration as the Oversight Committee may require, except that no statutory declaration shall be required if the complaint or information is made or given by any public officer or officer of the Authority. (2) The Oversight Committee may require any person making a complaint to deposit with it a reasonable sum not exceeding $1,000 to cover the costs and expenses that may necessarily be incurred by the Oversight Committee in dealing with the complaint. (3) Where the complaint is dismissed under section 41 (6) or is otherwise found to be frivolous or vexatious following a review or inquiry under this Part, the sum so deposited or such part thereof as the Oversight Committee may determine shall be applied for the payment of those costs and expenses; otherwise the sum so deposited shall be returned to the person making the complaint. 19 (4) Any person who makes a complaint to the Oversight Committee under this Part which he knows to be false in any material particular shall be guilty of an offence and shall be liable on conviction to a fine not exceeding $5,000. Review of complaint 41. (1) Subject to subsection (2), the Oversight Committee shall, upon receiving any complaint under section 40, refer the complaint to the Registrar for review. (2) The Oversight Committee may also, on its own motion, refer any information concerning any improper or dishonourable act or conduct of a public accountant, an accounting corporation, an accounting firm or an accounting LLP to the Registrar for review. (3) The Oversight Committee need not refer any complaint or information to the Registrar for review where the complaint or information relates to any matter set out in section 15 (1) or (4) or 31 (1), (2) or (4), and in such a case, the Oversight Committee may take such action as it thinks fit under that section. (4) The Registrar (a) shall review the complaint or information referred to him for the purpose of determining if there are sufficient merits therein to warrant the institution of disciplinary proceedings under this Part against the public accountant, accounting corporation, accounting firm or accounting LLP concerned; and (b) may, for the purpose of conducting such review, enlist the assistance of any public accountant or lay person on the Complaints and Disciplinary Panel. 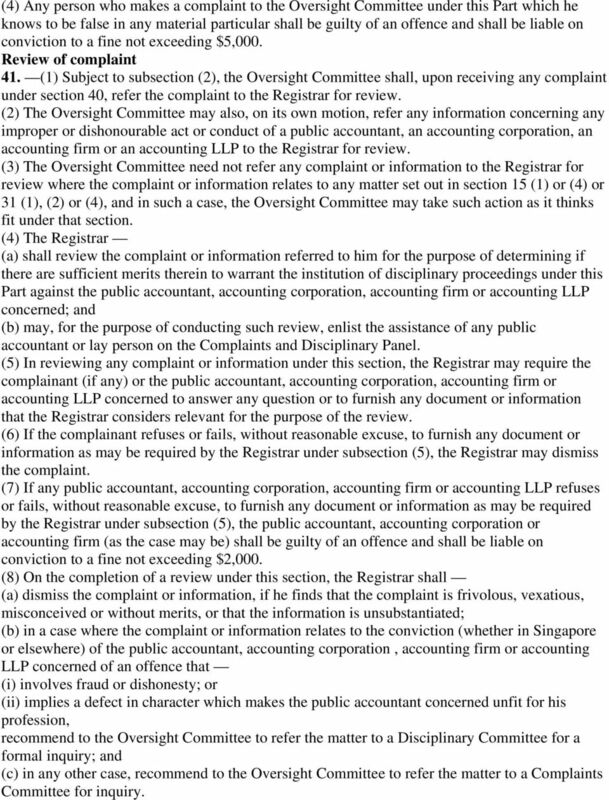 (5) In reviewing any complaint or information under this section, the Registrar may require the complainant (if any) or the public accountant, accounting corporation, accounting firm or accounting LLP concerned to answer any question or to furnish any document or information that the Registrar considers relevant for the purpose of the review. (6) If the complainant refuses or fails, without reasonable excuse, to furnish any document or information as may be required by the Registrar under subsection (5), the Registrar may dismiss the complaint. (7) If any public accountant, accounting corporation, accounting firm or accounting LLP refuses or fails, without reasonable excuse, to furnish any document or information as may be required by the Registrar under subsection (5), the public accountant, accounting corporation or accounting firm (as the case may be) shall be guilty of an offence and shall be liable on conviction to a fine not exceeding $2,000. (8) On the completion of a review under this section, the Registrar shall (a) dismiss the complaint or information, if he finds that the complaint is frivolous, vexatious, misconceived or without merits, or that the information is unsubstantiated; (b) in a case where the complaint or information relates to the conviction (whether in Singapore or elsewhere) of the public accountant, accounting corporation, accounting firm or accounting LLP concerned of an offence that (i) involves fraud or dishonesty; or (ii) implies a defect in character which makes the public accountant concerned unfit for his profession, recommend to the Oversight Committee to refer the matter to a Disciplinary Committee for a formal inquiry; and (c) in any other case, recommend to the Oversight Committee to refer the matter to a Complaints Committee for inquiry. 20 (9) The Oversight Committee may, upon accepting the recommendation of the Registrar under subsection (8) (b) or (c) (a) direct the Registrar to appoint a Complaints Committee; or (b) appoint a Disciplinary Committee, as appropriate, and refer the complaint or information thereto for an inquiry or a formal hearing, as the case may be. Power to proceed with complaint notwithstanding complainant s withdrawal 42. (1) The Oversight Committee may, if it thinks fit, direct that a complaint against a public accountant, an accounting corporation, an accounting firm or an accounting LLP be proceeded with at an inquiry of a Complaints Committee or a formal inquiry of a Disciplinary Committee notwithstanding that the complainant may have withdrawn the complaint at any time before or after the appointment of the Complaints Committee or Disciplinary Committee. (2) Where the Oversight Committee has made a direction under subsection (1), the complaint shall be proceeded with as if it had originated as information which the Oversight Committee had, on its own motion, referred to the Registrar for review under section 41 (2). Conviction final and conclusive 43. 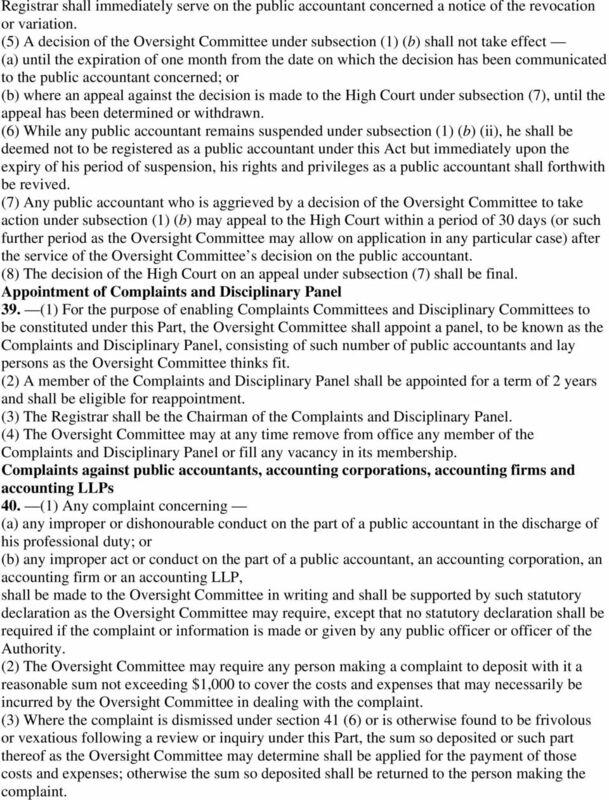 In any proceedings instituted under this Part against a public accountant, an accounting corporation, an accounting firm or an accounting LLP arising from his or its conviction of a criminal offence, the Registrar, the Oversight Committee, a Complaints Committee, a Disciplinary Committee and the High Court on appeal from any order of the Oversight Committee, shall accept the conviction as final and conclusive unless (a) it is subject to review or appeal that has not yet been determined; (b) it has been quashed or set aside; or (c) a pardon has been given in respect of it. Constitution of Complaints Committee 44. (1) A Complaints Committee shall consist of the following members, all of whom shall be appointed from the Complaints and Disciplinary Panel: (a) 3 public accountants; and (b) one lay person. (2) The Registrar shall designate one member of the Complaints Committee who is a public accountant to be its chairman. (3) A Complaints Committee may be appointed in connection with one or more matters or for a fixed period of time, as the Registrar thinks fit. (4) The Registrar may at any time remove the chairman or any member of a Complaints Committee or fill any vacancy in a Complaints Committee. (5) No act done by or under the authority of a Complaints Committee shall be invalid in consequence of any defect that is subsequently discovered in the appointment or qualification of the chairman or members or any of them. (6) A member of a Complaints Committee shall, notwithstanding that he has ceased to be a member of the Complaints and Disciplinary Panel on the expiry of his term of office, continue to be a member of the Complaints Committee until such time as the Complaints Committee has completed its work. Proceedings of Complaints Committee 45. (1) A Complaints Committee may meet from time to time for the purposes of its inquiry and may regulate its own procedure. THE CHILD PROTECTION (AMENDMENT) BILL (No. XXXIX of 2008) Explanatory Memorandum The object of this Bill is to amend the Child Protection Act to provide for a Child Mentoring Scheme. 28 November 2008 I. Deputy Chairman, Law Development Commission, Zimbabwe. Email : ldc@gta.gov.zw CHAPTER 24:19 COLLECTIVE INVESTMENT SCHEMES ACT Acts 25.1997, 22/2001 (s. 40, 14/2002 (s. 46), 16/2004 (s. 30), 17/2004 (s.
LAWS OF KENYA ACCOUNTANTS ACT No. 15 of 2008 Revised Edition 2012  Published by the National Council for Law Reporting with the Authority of the Attorney-General www.kenyalaw.org [Rev. 2012] No. REPUBLIC OF ZAMBIA THE INSURANCE ACT CHAPTER 392 OF THE LAWS OF ZAMBIA CHAPTER 392 THE INSURANCE ACT THE INSURANCE ACT ARRANGEMENT OF SECTIONS PART I PRELIMINARY Section 1. Short title 2. Application 3. REGISTRATION OF BUSINESS NAMES ACT, 1962 (ACT 151) As amended by REGISTRATION OF BUSINESS NAMES (AMENDMENT) DECREE, 1974 (NRCD 293)1.